Amsterdam-North has a turbulent history, from rise and flourishing to decay and resurrection. Thanks to the city district Amsterdam Noord these last years, this part of Amsterdam has been able to turn its socio-economic backwardness into a pull-position for the rest of the city. In short, we can without a doubt say that Amsterdam-Noord is a vital and fundamental part of Amsterdam in the 21st century and the new place-to-be. The eye-catcher of Noord is the A’DAM Tower, formerly Overhoeks Tower, next to the Eye-building. Starting summer of 2014 the Tower will be renovated and will get a new, mostly public, function. But until then, it serves as a building for creative entrepreneurs and mega-advertising column for culture-loving Amsterdam. 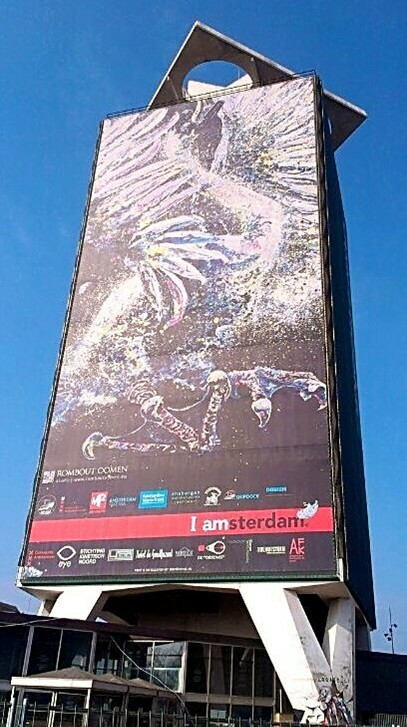 On March 26, 2014, around the municipal elections of 2014, a monumental work of art ‘Zwaan, Roadmap to Noord’ adorns the Northeast facade of the A’DAM Tower in the form of a banner of 52 x 25 m. The banner was to be seen until October 2014. The original painting, oil on linen, 250x160 cm , with the Swan, coat of arms of Nieuwendam, is created by artist Rombout Oomen and inpired by the work of Jan Asselijn, De bedreigde zwaan, which can be seen in the Rijksmuseum. On March 29, 2014 banner and painting has been revealed by Rob Post, chairman of Stadsdeel Noord, and donated to the City of Amsterdam. This project is realized in collaboration with Fleur Lamers, art historian and curator.